I haven't posted many book haul type posts for a while, because mostly they go onto my BookTube channel and I forget that I haven't talked about the books here on the blog, too. I don't think that's going to change, but I will start cross-posting my videos more often, and you might see more 'book post' type posts on my Instagram. Anyway, here is my epic March & April book haul, featuring some excellent books from the Orion Blogger Fest, amongst other things! What books have you received recently? Description: Speak out for the fate of millions or turn a blind eye? We all have choices. 1944, Germany. Ernst Beck’s new job marks an end to months of unemployment. Working for Erfurt’s most prestigious engineering firm, Topf & Sons, means he can finally make a contribution to the war effort, provide for his beautiful wife, Etta, and make his parents proud. But there is a price. Ernst is assigned to the firm’s smallest team – the Special Ovens Department. Reporting directly to Berlin his role is to annotate plans for new crematoria that are deliberately designed to burn day and night. Their destination: the concentration camps. Topf’s new client: the SS. As the true nature of his work dawns on him, Ernst has a terrible choice to make: turning a blind eye will keep him and Etta safe, but that’s little comfort if staying silent amounts to collusion in the death of thousands. My thoughts: I enjoy stories set in the World Wars - the significance of them is undeniable and I think it's important to keep alive all the heartbreaking aspects of the wars: "Lest we forget." 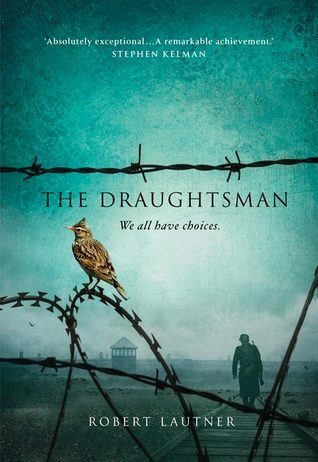 I came into The Draughtsman with high hopes that this would be a book I could recommend to people as another great snapshot that captured emotions and also, given that it's told from the point of view of a man working for the S.S., a different point of view. It let me down a bit. While The Draughtsman is an interesting story, I felt like it took a long time to get going. The author's style also grated on me quite a lot, with his frequent use of incomplete sentences. While it certainly shows the uncertainty of life in Germany during the final months of WWII, and the horrors of concentration camps and bombings, it didn't hit my feelings as much as I had hoped. It's not a standout. It's not that it's a poor story, but I wanted to be blown away, and I wasn't. It might be my own fault for coming in to this with high expectations, but I was let down by The Draughtsman. Interesting book set in Germany during the last few months of World War II, but there are better books with similar settings that I would recommend first. This one gets 5/10 from me. Description: Five years after the murder of his wife and fellow agent Alysha, Keon Rause returns to the distant world of Magenta to resume work with the Intelligence Service. With him he brings an illegal artificial recreation of his wife, an AI built from every digital trace she left behind. She has been constructed with one purpose - to discover the truth behind her own death - but Keon's relationship with her has grown into something more. Something frighteningly dependent. Something that verges on love. But as he investigates his wife's death, Keon begins to realise that he didn't know everything about Alysha. And if he couldn't trust his wife, how can he trust her copy? My thoughts: While I'm a huge sff fan, I stay a lot more on the 'fantasy' end of the scale. 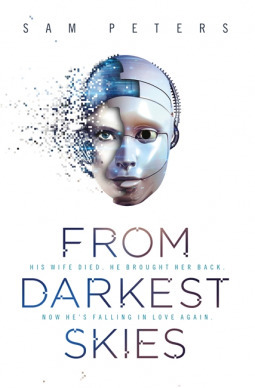 When I do dip in to sci-fi, From Darkest Skies is a perfect example of what I like to read. It's fast paced and while the technology is significantly more advanced than our own, the book doesn't get bogged down in trying to explain the science behind everything. In fact, most things just 'are' in the book - when something like a high tech weapon is used, there's enough description of how it's fired and the damage it does that a reader can picture what's happening, but doesn't go into more detail. From Darkest Skies is a police procedural crime novel, set on a tiny colonised planet sometime in the future. There are glimpses of how humanity came to leave earth, but that's not a big part of the story. Keon Rause has barely returned to Magenta, the planet, when he's pulled into investigating the death of a partying society girl. While it appears she overdosed somehow, the drug in question doesn't normally do any long-term damage. As Rause and his team investigate, the stakes get higher and higher - several someones do not want the truth to come out. Tied around this is Keon Rause's personal investigation into the death of his wife. I really enjoyed the speed of the novel - Sam Peters has created a tight plot where there is always something happening. I love shows like C.S.I. so reading a book like that with futuristic technology on a colonised world was a lot of fun. Peters has also built a brilliant cast of central characters. The other members of Rause's team have distinctive personalities and a variety of personal backgrounds and issues. My favourite was Rangesh, who certainly doesn't do things by-the-book and had me laughing a lot, even though he irritated me a little at first. I really hope there are other books set around these characters in future so we can continue to see them develop. The plot moves swiftly but the twists and turns kept me guessing. The capabilities of the AIs were a bit creepy at times, and there's a very 'big brother is watching you' aspect to the world with cameras everywhere. I thought the loopholes people found to work around that were really interesting. Overall, I really enjoyed this book and would highly recommend it, both to fans of sci-fi and those (like me) who read it less frequently. A police team solving crimes in space - what's not to like? I'm giving From Darkest Skies 9/10. Description: An incredible memoir from one of the world’s most eminent heart surgeons and some of the most remarkable and poignant cases he’s worked on. 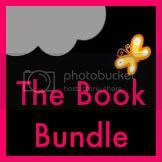 My thoughts: I don't read much non-fic but I'm challenging myself to read 6 nf books this year. I had Fragile Lives on my shelf from a giveaway which HarperCollins ran while I worked there, and I was very intrigued by the premise, so it seemed like a good place to start the challenge. I loved this book. Broadly, it follows Stephen Westaby's career, from university through to the present day, and takes you on a journey through some of the big developments in heart surgery during that time, looking specifically at valve alternatives and external mechanisms. While it's generally chronological, the book also looks at some of the most interesting cases Westaby has worked on, some of which are mentioned in the blurb above. While he uses plenty of technical terms, the author explained things well enough that I, with no knowledge really of how a heart works or the problems it can have, was able to follow quite easily what was going on in each situation and what the significance of certain details was. 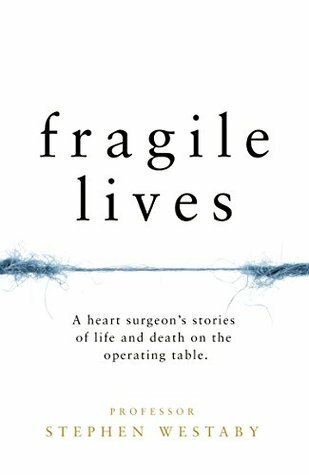 Fragile Lives is a fascinating look into an area of surgery where the stakes are very high and everything must be done very precisely. It was a really really interesting read, and I highly recommend it.